Truck lovers look for dependability, strength, and power in their vehicles. Perhaps this is why RAM trucks have been so successful throughout the years. 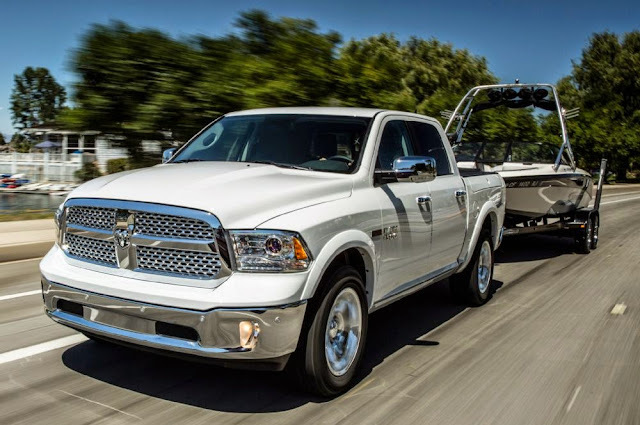 The pickup trucks at Melloy Dodge boast not only these traits, but superior towing capability that allows for greater versatility and the ability to work more efficiently, no matter what it is you’re moving. Whether you’re investing in a truck for work, fun, or a little bit of both, RAM trucks add utility and class to any task. The RAM 1500 is considered a “light duty” truck, but don’t let that classification fool you. The RAM 1500 still has 10, 650 lbs. max towing capability with a 1,900 lbs. max payload. This truck gives you the ability to haul big equipment, like towing boats, ATVs, or trailers, without added weight and wasted power. If you’re looking for something to move commercial equipment with the same ease, look no further than one of our two larger models- the RAM 2500 and the RAM 3500. Each of these models can tow a considerable amount using conventional methods. Considered to one of the most powerful pickups on the market, the RAM 3500 can drag up to 30, 000 lbs. The RAM 2500 keeps up with its older brother. Like the 3500, the RAM 2500 uses a 6.7-liter Cummins turbo-diesel engine that can generate 370 horsepower for maximum strength. The 2500 can tow 17, 970 lbs. in order to get the job done in a single trip. With the sixth annual New Mexico RV & Travel Show right around the corner, many buyers in the Albuquerque area are looking for a vehicle that can not only perform heavy duty work, but efficiently tow campers and more in order to get the maximum enjoyment out of their adventures on the road. Visit the New Mexico RV & Travel Show on March 27th, 28th, and 29th at the Albuquerque Convention Center. Ready to get a jump start on your summer travel plans with a RAM truck? Browse Melloy Dodge’s inventory of RAM trucks, or give us a call to schedule a test drive!